Welcome to the eastern part of the Czech-Moravian Highlands. If you are looking for our region on a large-scale map, the Svratka and Loučka rivers will lead you to us. You are on the border of two regions – South Moravia and the Highlands. What places of tourist interest can the relatively small area of our microregion offer? Whether you visit the castle of Pernštejn, Doubravník, Trenckova gorge or other nice places, you are sure to be satisfied. The area is very accessible through the road network. Railway transport has its own history here as well. The railway line no. 251 has been serving our region already since 1905. We are also proud of the fact that its developer was Ing. Osvald Životský born in Doubravník. And if you use the services of any of local accommodation facilities, you can stay with us for even more days. What places of interest can you find in our region? What may be appreciated by its visitors? Please join us and look at individual communities. There are eight of them, and another twelve settlements form their local parts. BOR | The history of this village is connected with Sejřek, its neighbour village. In the immediate surroundings of the village it is possible to find places with beautiful views. A part of Bor is also formed by Nedvědičky, a lonely settlement in the valley (the Podborskej Mill, later known as the Spálený Mill). ČERNVÍR | The name of the community was inspired by a whirlpool on the black river. It is one of the oldest communities in the area. The dominant building is the Church of the Assumption of the Virgin Mary. There is a cemetery around the church on the high headland above the Svratka river. The cemetery is bordered with a stone wall. Visitors will surely like the wooden covered bridge from 1718 whose length is 32 metres. DOLNÍ ČEPÍ | The dominant building of this village is the ancient little church consecrated to St. Wenceslas which used to serve for miners. Visitors will surely notice the marble monument to victims of World War I designed by František Paulus. DOUBRAVNÍK | The first mention about Doubravník dates back to 1208. The history of the community is connected with the development of the convent of Augustinian sisters and with the history of the Pernštejn Castle. The dominant building of this township village is the Church of the Exaltation of the Holy Cross. In the church it is possible to find the tomb of the Lords of Pernštejn (in 1645 it was plundered by the Swedes), the tomb of the Mitrovský family was built in the annex part of the church building in the 19th century. The square is unique amongst the communities of this region, in terms of both its size and shape. In the immediate surroundings you can see several hills, such as Bozinka with a Chapel of St. Mary Magdalene, Sokolí skála (which means Falcon’s Rock in English) and Pláňava. DRAHONÍN | One of the oldest communities of the microregion – the first mention dates back to 1208. In the community you can find the Chapel of Christ the King and a marble cross. The near Trenckova (or Trenkova) gorge is also a place which is pleasant to visit. HORNÍ ČEPÍ | The history of this settlement situated on the lower slopes of the Čepičkův hill (654 m above sea level) is connected with mining activities. Above the village it is possible to find places with an excellent view of the landscape. An important event of modern history is partisan resistance during World War II. CHLÉBSKÉ | The village has two parts – lower and upper ones. Your attention will be attracted by a little chapel consecrated to St. John the Baptist. Most visitors are attracted by Chlébské, without any doubt, in the spring when thousands of spring snowflake flowers start to blossom in the Chlébský brook valley nature reserve. KLOKOČÍ | The old history of Klokočí is connected with the Doubravník convent. On the village square it is possible to find a small chapel, a marble cross and a monument to victims of World War I with portraits of T. G. Masaryk and E. Beneš. KOVÁŘOVÁ | The Chapel of St. Cyril and Method will draw your attention in the same way as three crosses. From Kovářová you can also admire beautiful views of the hills in the surroundings as well as of the deep valley of the Svratka river. KŘÍŽOVICE | It used to be a farming village while at present a number of settlements belong to cottagers. There is a chapel of St. Cyril and Method. Sculptor Zdeněk Macháček has been active here since 1971. The aim of visits to Křížovice is the charming atmosphere of the little village, as well as the “Z ruky” Gallery of Stanislava Macháčková – Klapková. LÍSKOVEC | The community is named after the name of a shrub (hazelnut). The first mention dates back to 1371. On the village square you can see a chapel, iron cross, marble cross and a monument to victims of World War I. Even though this is a small village, several firms have their location there at present. LITAVA | A citadel was mentioned in the community as early as the 14th century. The Baroque building of the former coaching inn dating back to 1734 is interesting. The house was rebuilt to its current appearance in 1929. St. Ann’s Chapel is situated on the village square. NEDVĚDICE | The first documented written mention about Nedvědice dates back to 1350. It was the property of the Pernštejn family till 1596. Frequent trades and crafts in the history of Nedvědice were weavers, stone cutters, bakers, joiners. Later on there were built up larger operation plants and factories (textile factory, electrical technology plant – Radiomotor, later on MEZ). The parish Church of St. Cunigund was built in 1727. The beginnings of the school are connected with the year 1627. The monument to war victims (author: Josef Axman) made of one piece of marble dates back to 1925. OLŠÍ | One of the oldest communities of the microregion, whose history is connected with the Doubravník convent. It belongs among the communities whose names originate from the names of trees (alders). The area with the small St. George’s Church on a low hill makes a cosy impression. The church was rebuilt in 1784 and modified in 1905. PERNŠTEJN | A local part of Nedvědice, dominated by an ancient castle. This castle is one of the best preserved castles in the Czech Republic and is a grateful destination of tourists and of those who love history. The castle was founded in the second half of the 13th century. It belonged to the Pernštejn family till 1596. The last owners before the transfer to the state were the Mitrovský family. In 2007, Pernštejn finished on the second place in the survey for the most fairy-tale castle in the Czech Republic. The monumental yew which grows in front of the first gate won the award “Tree of the Year in the Czech Republic” in 2005. PRUDKÁ | A wooden bridge over the Svratka river (unfortunately very often damaged by vandalism), railway tunnel, recreation centre of Czech Railways, former mill and a paper production plant, which was in operation until recently, characterise this settlement quite well. You cannot overlook Sokolí skála (Falcon’s Rock) above the tunnel. RAKOVÁ | written also as Rakové – one of the oldest village of the region. Old history connected it with the convent in Doubravník. At present a local part of Olší. You can see a small chapel consecrated to St. Ann there. SEJŘEK | The first mention about the community dates back to 1350. You can see a small Chapel of St. Ann and four crosses made of Nedvědice marble there. A popular place is the “Stráž” hill from which you can have a marvellous view. A part of Sejřek is the community of Mansberk (established in 1803 by Josefa Schröfflová). The monument from 1998 reminds us of the 100th anniversary of foundation of the local fire brigade. SKOROTICE | A mention about the community from 1309 documents that this settlement is very old. On the village square you can see a nice little chapel consecrated to the Virgin Mary and the building of the former school from 1895. UJČOV | A village situated in the Svratka river valley. The first mention is from 1360. Your attention will be attracted by the monument to victims of World War I and by the wayside cross (author: František Paulus) and the chapel consecrated to St. Francis. Besides farming, traditional activities in the community are wooden article production and fish breeding. A part of Ujčov is formed by Kasany (Kasán) and Bořinov. 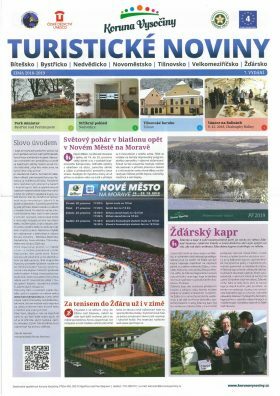 The Pernštejn microregion arose on the basis of an agreement made by eight communities which have common historical roots. They are situated in the area which was inhabited already in the early medieval period. It was surrounded by vast forests and settlements spread mostly along water courses. The beginnings of these settlements are ascribed to the Lords of the European bison’s coat-of-arms, Lords of Medlov, ancestors of the famous Pernštejn family. The first written mention from 1208 documents acquisition of the “Doubravník hide row village” from the Olomouc bishopric in an exchange for two villages. In Doubravník, the Lords of Medlov founded the family Augustinian convent documented by a deed from 1231. The Pernštejn castle was mentioned in writing in 1285 and its owners became, during the 14th to 16th centuries, one of the leading Moravian and later even Bohemian aristocratic families, who influenced the history of the Bohemian Kingdom in a significant way. They owned the family castle of Pernštejn, called “the castle of castles” and also “marble castle”, considered as one of the most beautiful castle constructions of Central Europe, until 1596. Then the castle had a number of owners and its construction development was influenced especially by the following families: Lichtenstein, Stockhamer and the last owners, i.e. the Mitrovský family of Mitrovice and Nemyšl. The centre of the estate was Doubravník in which the Pernštejn family built the beautiful Church of the Exaltation of the Holy Cross in 1535-57 in the late Gothic and Renaissance styles. The area which used to be extramural settlement below the Pernštejn Castle – small town of Nedvědice only started to develop at the beginning of the twentieth century, after construction of the textile factory and expansion of both quarrying and processing of marbles, and from the 1920s also after the launch of manufacturing of electrical motors. Nedvědice has gradually acquired a position of the centre of this area. Černvír – the beginnings of the church and of the castle fall to the period before the arrival of the Lords of Medlov. The church was originally a Romanesque construction, later on it was rebuilt. Your attention will be attracted by the wooden covered bridge over the Svratka river from 1718. Drahonín was a royal estate which was donated by Queen Constance to the newly founded convent of the female branch of the Cistercian Order “Porta coeli”. Olší with the church was donated by Demeter of Bukov in 1285 to the Doubravník sisters. Ujčov, Horní and Dolní Čepí were held by local gentlemen and freemen, in 1496 the villages were purchased by Vilém of Pernštejn. The filial Church of St. Wenceslas in Dolní Čepí originates from the 15th century. Skorotice was held by the Doubravník convent, and after its cancellation it belonged to the Pernštejn family. Chlébské belonged to a freeman’s family and in the 15th century it was acquired by the Pernštejn family. Sejřek and Bor were held by aristocrats of a minor importance. The area of the region belongs to the Svratka Highland nature park. Its axis is formed by the Svratka river. The nature is very diverse here and has a lot to offer to its admirers. The countryside is very rich and is formed by many landscape elements. You can find there deep valleys of the Svratka and Loučka rivers, their tributaries, sharp and rocky slopes, river bank floodplains as well as places with distant views. The geological composition is very diverse and gave origin to the economic use of the region as well. There were mined ores of silver, precious metals, iron and uranium. There were quarries for white (Nedvědice) marble for construction of churches as well as for cemetery monuments, and decorative green marble was quarried there too. This is connected with the origin of stone cutter’s trade in the region. There is also clay for brick production. Mineralogical locations, especially in the surroundings of Nedvědice and Drahonín attract collectors with the diversity of minerals which can be found there. Thanks to the morphology of the landscape and geological subbase it is possible to find a very diverse plant community and to see various animals in the region. In the spring you can admire plenty of blossoms of spring snowflake flowers in the Chlébský brook nature reserve, a yellow carpet formed by flowers of golden dust on the Sokolí skála (Falcon’s Rock). You can find there also deep red cyclamens, Turk’s-cap lily, fringed gentian, various lizard orchids and other rare and attractive flowers. The landscape is typical of vast forests which are rich in mushrooms and attract mushroom pickers from both near and wide surroundings. Concerning animals, it is possible to see there protected eagle owls as well as grey crows, you can admire the brilliant beauty of the kingfisher or fidgety movements of dippers, a herd of moufflons, as well as other animals. The Svratka river is famous thanks to its trout and grayling and therefore it is a destination of many fishermen. International fly-fishing competitions are organised there every year. Also those who admire beetles and butterflies can see many attractive or even protected species there. Thanks to its natural beauties and clean environment, our region has become a very popular recreation area. Many visitors and guests therefore spend their holiday in hundreds of recreational cottages, chalets and accommodation facilities every year. The Pernštejn microregion was formally established on 30 November 2007. Eight communities entered this formation: Nedvědice, Černvír, Doubravník, Drahonín, Olší, Sejřek, Skorotice and Ujčov. Within the framework of enhancement of tourist services, the project entitled “Come to see our region!” has been prepared in order to provide our visitors with information about the area of the microregion, its places of interest and important elements with a focus on all target groups of tourists. This project is co-finance by the European Union.